At thirty-three, talented chef Georgia Gray has everything a woman could want--the top job at one of Manhattan's best restaurants; a posse of smart and savvy gal pals who never let her down; and a platinum-set, cushion-cut diamond engagement ring courtesy of Glenn, the handsome entertainment lawyer who Georgia's overbearing mother can't wait for her to marry. The table is set for the ambitious bride-to-be until a scathing restaurant review destroys her reputation. To add salt to her wounds, Glenn suddenly calls off the wedding. Brokenhearted, Georgia escapes to the Italian countryside, where she sharpens her skills at a trattoria run by a world-class chef who seems to have it all--a devoted lover, a magnificent villa, and most important, a kitchen of her own. Georgia quells her longings with Italy's delectable offerings: fine wine, luscious cheeses, cerulean blue skies, and irresistible Gianni--an expert in the vineyard and the bedroom. So when Gianni tempts Georgia to stay in Italy with an offer no sane top chef could refuse, why can't she say yes? An appetite for something more looms large in Georgia's heart - the desire to run her own restaurant in the city she loves. But having left New York with her career in flames, she'll need to stir up more than just courage if she's to realize her dreams and find her way home. "A delightful meal of a read--delicious and satisfying. This new writer is one to watch!" “All the right ingredients--a heart-warming heroine, a romp through Tuscany--make for a delicious book that leaves you hungry for more." --Giada De Laurentiis, New York Times bestselling author of Everyday Italian. "Jenny Nelson delivers on her debut with a rich and delicious read. With a fresh, charming and spirited voice, Nelson will have readers cheering for Georgia!" 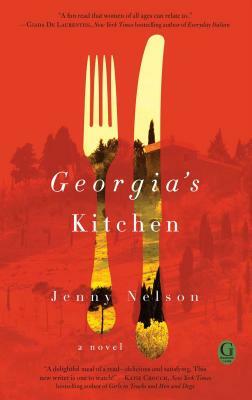 "Jenny Nelson is no flash in the pan; this delectable concoction of gastronomy and self-discovery, spiced with fashion and romance, will have her fans clamoring for more." "Georgia Gray's adventures in the kitchens of New York City and Tuscany and with love on both continents, makes for a thoroughly enjoyable read. This glamorous and delicious tale will have readers cheering as the plucky heroine moves from disaster to dreams-come-true."